The members and partners of the Czech CLARIN consortium have recently submitted a proposal to establish DARIAH-CZ, a Czech node of the DARIAH European researcher infrastructure for arts and humanities. 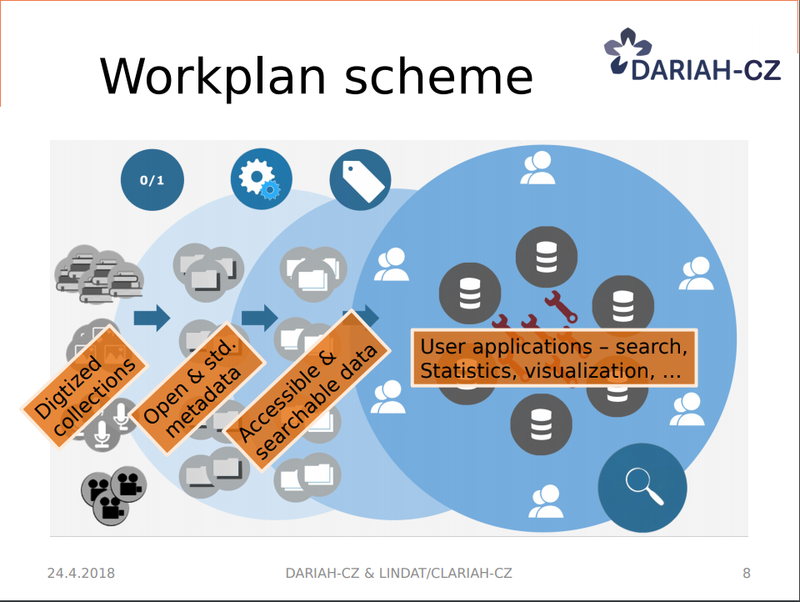 In light of the proposal, a 1-day international workshop titled DARIAH-CZ Workshop on Digital Humanities 2018 was held in Prague on 24 April at the Academy of Sciences of the Czech Republic in order to introduce the project and to generally promote computational approaches within Humanities and Social Sciences both in the Czech Republic and internationally. During the workshop, sixteen lectures were given by prominent computational and Digital Humanities researchers working at leading Czech and European research institutions. The workshop was well attended. There were around 70 participants, most of whom were researchers from various Czech institutions while some also came from Slovakia, Poland, Hungary, and Germany. The workshop began with the introduction of the European projects, institutes and related to the DARIAH-CZ project both structurally (DARIAH, DARIAH-PL, DESIR) and thematically (EADH, Austrian Centre for Digital Humanities). In the afternoon, the Czech projects that are planned to be integrated in DARIAH-CZ were presented. Perhaps most prominently, Pavel Straňák gave a comprehensive presentation of the LINDAT/CLARIN repository and Silvie Cinková introduced the recently established Czech Association for Digital Humanities, which will be a partner in the project. The afternoon session was concluded with a lecture on EHRI, which is a portal dedicated to the presentation and interpretation of Holocaust-related archival documents on the basis of digital tools. Electronic Enlightenment, which a wide-ranging online collection of edited correspondence from the early 17th to the mid-19th century. The workshop successfully raised awareness of the proposed DARIAH-CZ and its related projects in the context of Digital Humanities. In addition, it strengthened the ties between the members of the Czech CLARIN consortium, its related partners and other national and international institutions, opening new research avenues for further collaboration. Blog post written by Barbora Hladka, edited by Darja Fišer and Jakob Lenardič.